Picture an old Midwestern barn complex filled with all types of artisans where animals once stood, add to that several rows of tents on the grassy area next to the rustic barn structures that house additional artist demonstrating and displaying their works of art. That sets the scene for a 40 year old event that was first held on the grounds of the Amana Heim Museum in Homestead and then moved to under the oaks at the Middle Amana Park. In the two years since it was moved to the Market Barn area of the village of Amana, the number of artists has more than doubled and so have the patrons for this juried show that takes place each August. Of course, what’s a festival without great food and the Festival of the Arts has that covered with homemade desserts from Amana bakers along with apple fritters that are made fresh while you watch. Amana bratwurst is special and is available at most Amana festivals and this one is no exception. After seeing the artist at work, we hope that your children are inspired to create some of their own artwork at the free Children’s Corner. There is no time like the present to get them involved in artistic expression. The Festival of the Arts in the Amana Colonies is an extension of the Colonies rich history of art and is a fundraiser for the Amana Arts Guild that is located in High Amana. 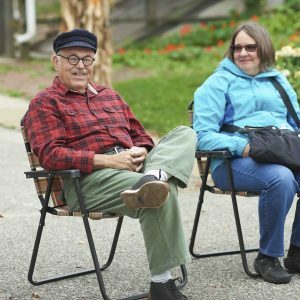 They sponsor art classes, workshops, apprenticeships, exhibits and various art related events throughout the year along with maintaining a historic Colony garden and a blacksmith and wagon shop. Their events and programs are for all ages and attract approximately 5,000 people annually.